Grider Field Baseball Diamond was a baseball park at the Grider Field Air Force Base in Pine Bluff, AR. It was used as a spring training site for the St. Louis Browns' farm system from 1947-1951. 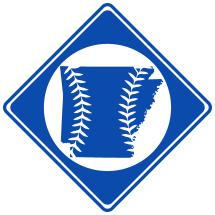 See Spring Training in Pine Bluff. The baseball field, which has no official known name, was located at what is now the Pine Bluff Municipal Airport. The airbase, located about 4 miles southeast of Pine Bluff, was built in 1940 as an aviation school for the Army Air Corps. The school closed in 1944 after World War II ended, and the camp was turned over to the city of Pine Bluff in 1947. When Richard Muckerman became the owner of the St. Louis Browns in 1945, he announced his intention to start a long-range program to develop the Browns’ minor league players. The problem was finding a place large enough to hold camp for the hundreds of players in St. Louis’ farm system. Grider Field, unused since the aviation school closed, was perfect. It featured barracks, a mess hall and a baseball diamond. Thus, Grider Field became the Browns’ new minor league spring training camp. The Grider Field Baseball Diamond first saw use as a spring training field in 1947 when 300 players from 13 of the Browns’ minor league teams were sent to Pine Bluff for Grider Field’s inaugural year as a baseball school. 4 to 6 games were played daily at the baseball field and at Taylor Field in downtown Pine Bluff. All night games were player at Taylor Field because the baseball diamond at Grider Field was not lighted. In fact, the Grider Field baseball diamond featured little more than a field and a backstop. The Browns held spring training in Pine Bluff again in 1948 and continued to do so for the next 4 years. In 1949, 10 teams were sent to Pine Bluff, and the next year, a total of 200 players were trained. Grider Field’s final year as a baseball camp came in 1951. That year, St. Louis’ farm system shrunk down to only 9 teams, and 5 of them trained in Pine Bluff. Today, most of the original Grider Field, including the baseball diamond, is now gone. The city of Pine Bluff still uses Grider Field as an airport, but there is no physical sign that it ever had anything to do with professional baseball.